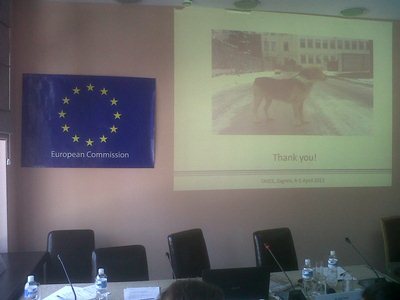 On the 17th of April 2013 a multi-beneficiary TAIEX (Technical Assistance and Information Exchange) workshop on stray animals was held in Belgrade, Serbia. The TAIEX is the Technical Assistance and Information Exchange instrument managed by the Directorate-General Enlargement of the European Commission. TAIEX supports partner countries with regard to the approximation, application and enforcement of EU legislation. Technical assistance through the TAIEX instrument comes in many different forms. Workshops, study-visits and expert mission provide assistance to beneficiary countries on the approximation and implementation of EU legislation. Aim of the workshop was to train veterinary inspectors, officials and approved veterinarians on how to perform controls on stray animal populations and to clarify the roles of national and international authorities, NGO and others. Several experts participated in the event, belonging to the Directorate General for Health & Consumers (DG SANCO) of the European Commission, to the World Organisation for Animal Health (OIE), to the Veterinary Directorate of the Serbian Ministry of Agriculture, Forestry and Water Management, to Research Institutes on animal health and welfare, and to the NGOs. From our Institute, dr Stefano Messori, of the Human-Animal Relationship and Animal Welfare Laboratory, participated as an expert, holding a speech about the role of traceability in improving the effectiveness of action to control stray animals, and showing the activities of the Institute about this concern. All training material, including the presentations of the expert, are available on the official TAIEX website: ec.europa.eu/enlargement/taiex.